Please meet Ruaraidh (pronounced Roo-ree) the West Highland Terrier belonging to our Distillery Manager James MacTaggart. Ruaraidh is independent of character with a mischievous glint in his eye and is much admired by visitors to our Distillery in Lochranza. This limited edition bottling was drawn from 22 ex-Sherry Hogsheads distilled in 1998 and specially selected by James MacTaggart under the careful supervision of Ruaraidh. 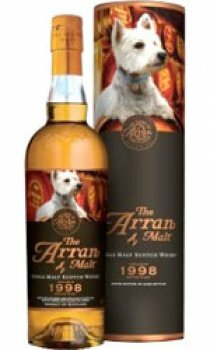 After 12 years of maturation this expression of Arran is rich & warming with a delightful complexity.